Evgeny Freidman is a business partner of attorney Michael Cohen, and he's agreed to work with prosecutors in state and federal investigations. The New York Times reports a man who did business with President Trump's lawyer Michael Cohen has agreed to help prosecutors in state or federal investigations in exchange for avoiding jail time. Evgeny Freidman, one of New York City's biggest taxi fleet owners, worked with Cohen in the taxi business for years. He had been accused of failing to pay north of $5 million in taxes and was up against tax fraud and grand larceny charges. His plea deal means he could spend five years on probation instead if he follows through on the terms of the agreement. 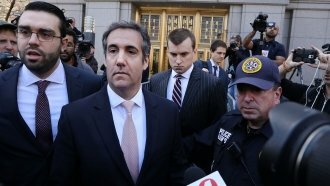 The move could put more pressure on Cohen himself to cooperate with prosecutors. If Cohen works with prosecutors, it could be bad news for President Donald Trump. But so far there's really no way to know that for sure, since we don't know the extent of what prosecutors may have on Cohen or what he might say to prosecutors about the president, if anything. Authorities raided Cohen's office and hotel room in April and collected information that included his communication with his clients. Among other things, they reportedly sought information on Cohen's payment to adult film star Stormy Daniels, who says Cohen paid her to keep quiet about her alleged affair with Trump. Bear in mind, there are a lot of "ifs" here. If this case were to change Cohen's approach to prosecutors, and he has damaging information on the president, it could mean Cohen gives it to prosecutors. So, it may be a stretch, but that's why this guy's plea matters.